Lindsay Ann Reid is a graduate of the University of King’s College (BA in Classics and Early Modern Studies, 2003) and the University of Toronto (MA in Comparative Literature, 2004; PhD in English and Book History, 2009). Before joining the National University of Ireland, Galway, she previously taught at several universities in Canada and worked as an Assistant Professor of English and Comparative Literature at Koç University in Istanbul, Turkey. Her primary research and teaching interests include literature c. 1350-1650, classical poetry, mythology, adaptation and reception studies, and early English print culture. She welcomes enquiries from prospective postgraduate students wishing to pursue research in affiliated areas. Dr Reid is the author of two monographs, Ovidian Bibliofictions and the Tudor Book ( 2014) and Shakespeare's Ovid and the Spectre of the Medieval (2018). She has published and forthcoming work in journals such as Renaissance Quarterly, Early Theatre, The Seventeenth Century, English, Comparative Drama, and Translation and Literature, and she has recently contributed chapters to book collections including Shakespeare on Screen: ‘The Tempest’ and Late Romances (2017), Ground-Work: English Renaissance Literature and Soil Science (2017), and Singing Death: Reflections on Music and Mortality (2017). (2018) Shakespeare's Ovid and the Spectre of the Medieval. (2014) Ovidian Bibliofictions and the Tudor Book: Metamorphosing Classical Heroines in Late Medieval and Renaissance England. (2018) OUP Blog: 'Imagining Lost Books in the Age of Cambridge Analytica'. (2020) [forthcoming] Anchises entry in The Chaucer Encyclopedia. (2020) [forthcoming] Athamante (Athamas) entry in The Chaucer Encyclopedia. (2020) [forthcoming] Biblis entry in The Chaucer Encyclopedia. (2020) [forthcoming] Danao (Danaus) entry in The Chaucer Encyclopedia. (2020) [forthcoming] Dane (Daphne) entry in The Chaucer Encyclopedia. (2020) [forthcoming] Demophon, Demophoun entry in The Chaucer Encyclopedia. (2020) [forthcoming] Polite(s) entry in The Chaucer Encyclopedia. (2017) The Passionate Pilgrim [chapter-length] article in The Definitive Shakespeare Companion: Overview, Documents, and Analysis. (2014) ‘Neuer before Imprinted’ (in Out of Sequence: The Sonnets Remixed). (2019) [forthcoming] Review of Spenser’s Narrative Figuration of Women in “The Faerie Queene” by Judith H. Anderson for Sixteenth Century Journal. (2018) Review of Word of Mouth: Fama and Its Personifications in Art and Literature from Ancient Rome to the Middle Ages by Gianni Guastella for The Journal of Roman Studies. (2018) Review of Agency and Intention in English Print, 1476-1526 by Kathleen Tonry for Renaissance Quarterly. 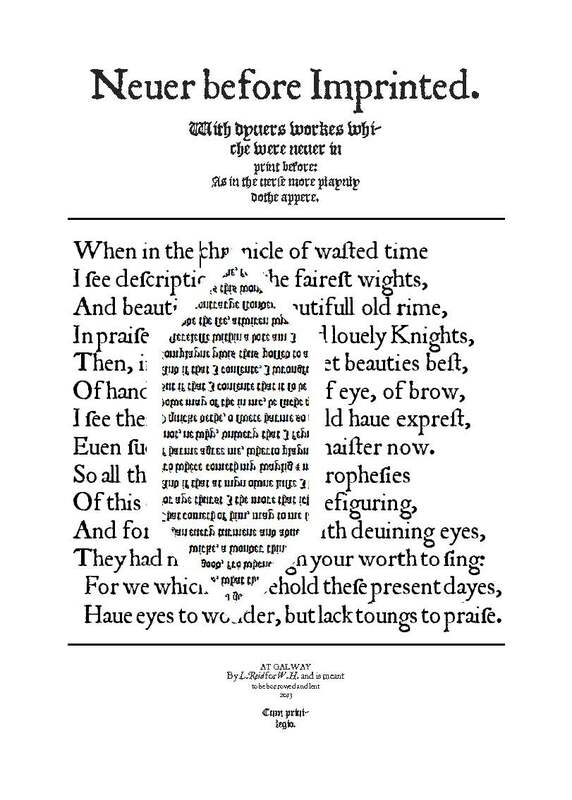 (2016) Review of The Impotency Poem from Ancient Latin to Restoration English Literature by Hannah Lavery for The Spenser Review. (2015) Review of The Ovidian Vogue: Literary Fashion and Imitative Practice in Late Elizabethan England by Daniel D. Moss for Sixteenth Century Journal. (2015) Review of Women in Shakespeare: A Dictionary by Alison Findlay for Australasian Drama Studies. (2015) Review of Love in Print in the Sixteenth Century: The Popularization of Romance by Ian Frederick Moulton for Sixteenth Century Journal. (2010) Review of Metamorphosis: The Changing Face of Ovid in Medieval and Early Modern Europe, eds. Alison Keith and Stephen Rupp for University of Toronto Quarterly.